Rich Lerner helmed this swell Golf Central feature on Arnold Palmer's legacy of autograph signing and eye contact. The footage of Deacon's tractor is fun, as is the bigger point conveyed makes this one a good story for young players to absorb. Zack O'Malley Greenburg summarizes the Forbes list of deceased celebrity earners and while Michael Jackson's catalog continues to sell, Arnold Palmer's brand continues to thrive a year since his passing. "The Other Arnold: Palmer's daughter reflects on the chasm between the brand and the man"
Carve out a few minutes for Michael Bamberger's Golf.com story on Peg Palmer if you haven't already. A year after her father's death, the 61-year-old is celebrating her father's legacy but also lamenting many things, from the production values of her father's funeral to the $25,000 designated for Doc Giffin in the estate. Mostly, however, she fears the Arnold Palmer "brand" will "subsume any real sense of whom her father was." It's a fascinating read on many levels and clear the 61-year-old has no interest in tainting her father's legacy. However, she's not a fan of some. The power, the fame, the money, at some point it distorted who he was," Peg said. "Marketing turned Daddy into somebody who was pretty bland, and he was not bland." Mark McCormack and Alastair Johnston and the company they worked for, IMG, comes up often in her conversations. McCormack, the founder of IMG, was a marketing genius. Johnston got the deals signed and tracked the numbers. Peg finds Johnston, a native Scot, to be opaque and cold in their business dealings. But her standards are outside the norm. She is uncommonly giving and open. "He put the time into his clubs because he loved doing it—he was a man who did what he loved. My dad was a manly man, kind of macho, kind of a chauvinist, but he was also a very creative person. The workshop gave him a chance to be creative. It wasn't mindless repetition. It was part of a process. He was at his most focused, his most engaged, his most peaceful, when he was in the workshop. It was a tonic for him. He liked seeing sparks fly, he liked all the stimuli of the workshop. "Working on the clubs also kept him in touch with his working-class roots. I think my dad really celebrated the working class, and he felt connected to people who did things for themselves, as he did. That helped him be the architect of his own destiny. Doing things with his own tools, with his own hands, that was part of his identity. Josh Sens of Golf.com catches up with Doc Giffen, close friend, confidante and trusted assistant to Arnold Palmer as the September 25th anniversary of The King's passing approaches. There are so many ways we miss people who were close to us after they’re gone. But is there anything in particular you miss about Arnold? Given that he won here in 1961 and in doing so, re-validated The Open at a time when it was not at peak strength. And still so soon after his passing, this is obviously a sentimental week for Arnold Palmer fans who have two nice tributes to enjoy. The R&A has a tribute to him at the 18th (and to Roberto de Vicenzo), while the club has commemorated his epic shot at the 16th (then the 15). And this new Mastercard ad set to run during The Open is especially well done. The final round of The Masters starts Sunday at 2 pm ET, but the warm-up shows should be incorporated into your viewing schedule. Jim Nantz Remembers has become a staple of the pre-final round Masters viewing and this year's is extra special given that it turned out to be Arnold Palmer's last television interview. Nantz told writers on CBS's conference call of how the option was placed before his friend Mr. Palmer to do a chat following the 2016 Masters honorary starters shots. After that special moment with Jack Nicklaus and Gary Player, Mr. Palmer gave Nantz the thumb's up that he was up for it, CBS raced to set up Butler Cabin and Nantz relayed how, when the lights went on, The King provided over 20 minutes of great stories and memories. Prior to that at 12:30 pm ET Sunday, Bill Macatee sits down witih Phil Mickelson to detail his Masters wins and I've heard throgh the grapevine that it's a fascinating chat for any Masters fan. THE MASTERS: PHIL! is an inside look at the remarkable career of Phil Mickelson, framed by his three memorable victories at the Masters. From his first swings as a toddler at his family’s San Diego home to his unforgettable trio of Masters victories, Mickelson has enjoyed a career spanning three decades to become one of the game’s most beloved champions cementing his place among golf’s greats. I think we all hate dwelling on the future of the Arnold Palmer Invitational in the year following The King's passing. But Palmer was a businessman who loved and nurtured this event. So discussing its past, present and future would presumably resonate with him even as he would undoubtedly be uncomfortable taking attention away from the players. Jeff Babineau did a super job for Golfweek.com summing up Wednesday's ceremony at Bay Hill to remember The King, but also reflected on how far this event has come and where it may go without Palmer. The API, which moved to Bay Hill from nearby Rio Pinar (Florida Citrus Open) in 1979, has come quite a long way. The purse has been bumped to $8.7 million, and this week’s winner not only will leave $1.56 million richer, but will receive a three-year PGA Tour exemption, not the usual two a winner grabs. This week’s event will celebrate the everyday fan who connected with the blue-collar likes of Palmer, with large public grandstands now sitting up close to seven of the course’s greens. It’s a far cry from Year 1 at the then-named Bay Hill Citrus Classic in 1979, when the makeshift grandstand that sat behind the 18th green was borrowed from nearby Boone High School. That little nugget is a perfect reminder that is was events like the Bay Hill Citrus Classic, the Western Open, the Los Angeles Open, the Houston Open, the Bob Hope and on and on we can go with 10-12 events that built and stabilized the PGA Tour. And with too much regularity, the focus of these events revolves around their weaker-than-normal fields, their strange new dates or their difficulty in attracting a sponsor. Nearly all have been adversely effected by many factors, but it's the creation of World Golf Championship events that consistently tops all side-effects. We all understand the globalization of golf and market forces, but when those forces so adversely impact even an event nurtured by a modern sports legend. it's time for all current players and executives to take a hard look at the tour's purpose. Because if this is, as they say, about playing opportunities and charitable dollars, it's these core founding events that deserve to be treated as kings. It's a strange state of affairs when Billy Horschel is a voice of PGA Tour reason, especially after he said he would have passed on playing in the WGC Mexico had he qualified. Somehow, the event carried on. But it is fascinating to see Horschel join the likes of Louis Oosthuizen and Henrik Stenson in highlighting the lack of star power likely at next week's Arnold Palmer Invitational, the first without The King. Even with multiple tributes planned, including a 13-foot tall statue of Palmer, the stars are passing. Will Gray with some of the other player comments about what is shaping up as a weak field next week in Orlando. Doug Ferguson considered the convoluted road to Augusta, altered by the location and placement of two World Golf Championship events. He also talked to Rickie Fowler who is contemplating a pass on the easy money and points of the WGC Match Play for the API. And given Steve Stricker's comments Tuesday at the Valspar Championship, Tiger Woods is not a likely last minute contestant either. Bob Harig reports. The New York Times' Karen Crouse catches up with Sam Saunders, who had a dreadful fall when he lost both of his grandfathers while also having to withdraw from the Web.com Tour Playoffs to care for his ill child, Ace. But Saunders is back playing the Web.com Tour and able to reflect with great strength about what must be such a tough topic: his unexpected last call with grandfather Arnold Palmer. He was caring for Ace on Sept. 25 when Kelly reminded him to check in with Palmer, who was in a hospital in Pittsburgh preparing for surgery. Saunders knew his grandfather would appreciate hearing from him. Since the death in 2003 of Mark McCormack — Palmer’s friend and business manager, who slipped into a coma after going into cardiac arrest while having minor surgery at a dermatologist’s office — Palmer had stubbornly resisted any medical procedure that required anesthesia, including hip replacement. “For a guy who seemed so tough, he was scared of that,” Saunders said. Palmer answered on the first ring, and their brief conversation sounded no alarms with Saunders, who said he was caught completely off guard when his father called a few hours later to relay the news that Palmer, 87, had died. Golf.com is rolling out a story per day from their special tribute issue honoring Arnold Palmer, whose passing will be remembered as golf's defining moment of 2016. This Q&A with longtime sidekick Doc Giffin suggests, as you'd expect, it's been tough without The King around. In the days since Arnold's death, what has it been like in the office without him? It's different. In the past, sometimes he'd beat us in. But in recent years, the staff—myself and three others—we'd be here ahead of him, and always anticipate him coming around the back of the building in his golf cart. He'd drive it down from the house at 10 or 10:30 and beep the horn when he was coming. Yeah, I miss him coming into the office and saying, "Good morning! Well, what do you have for me today?" Miss the beep. 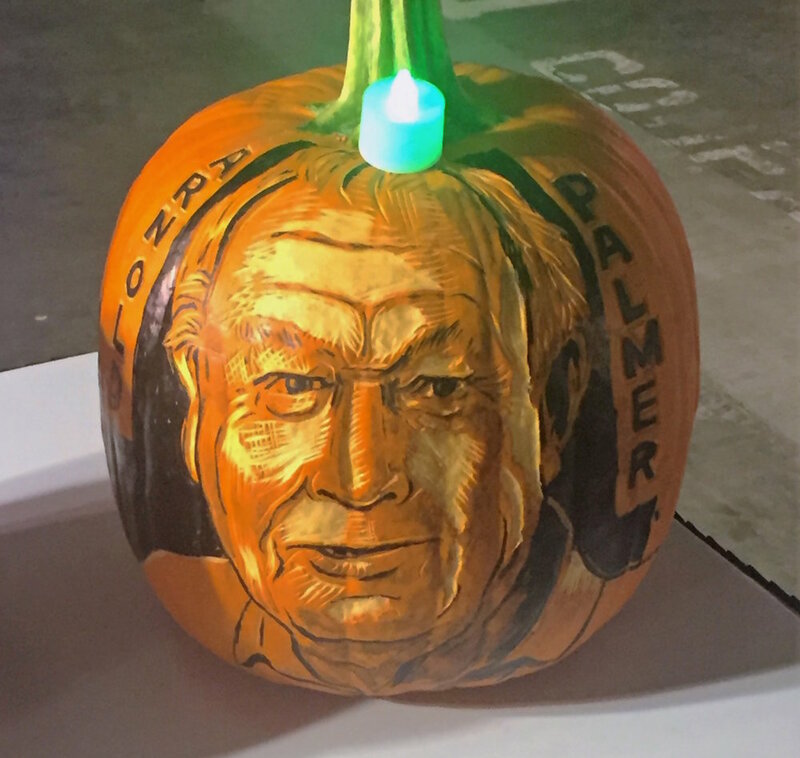 "At Bay Hill, moving on after Arnie isn't easy"
Thanks to reader Andrew for this photo from the Rise of the Jack O'Lanterns where there are some pretty tremendous efforts on display, with a big emphasis on celebrities we've lost in 2016. 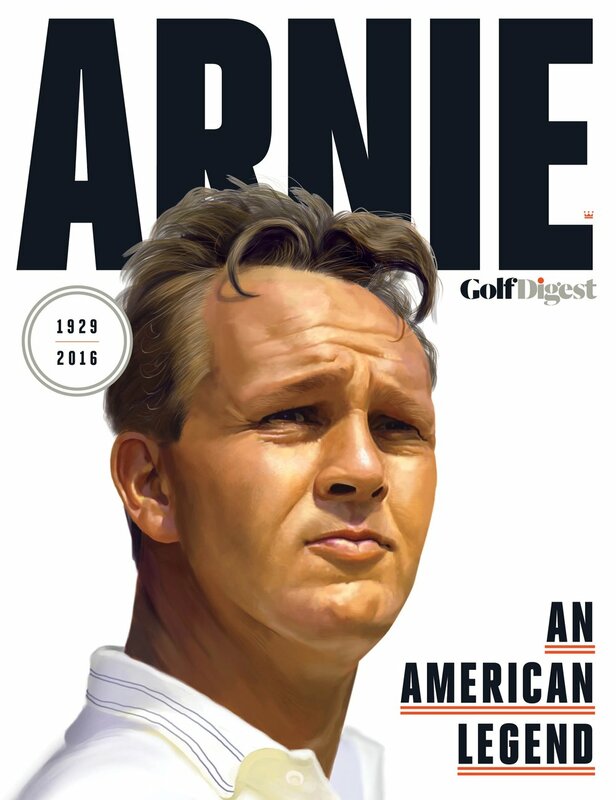 Let's get the predictable headline out of the way: it was a tribute fitting for a king. In this case, The King. A nice blend of speakers mostly adhered to family wishes to keep things light, and those who didn't (unintentionally) offered those feeling emotional a few moments to collect themselves before another speaker would have you laughing or crying. The service spanned two hours and 19 minutes, and allowed guest speakers to share their memories and describe how Palmer impacted their lives and the game of golf. While every speaker brought something special to the proceedings, though Jack Nicklaus, grandson Sam Saunders, Jim Nantz and aviation pal Russ Meyers stood out for capturing the best things about Arnold Palmer, while Vince Gil's memories and rendition of Carole King's You've Got A Friend had attendees like Tom Watson singing along. Jaime Diaz was present and wrapped up the service in this GolfDigest.com story. The scene before his memorial service at the bucolic campus, only two miles from where Palmer learned to play golf at Latrobe C.C., also contained contrasts. The nearly 1,000 who would enter the lovely basilica were somber as they shuffled in, but also carried a palpable energy. It was the power of memory. Fulfilling the simplest metric for a life well-lived, Palmer, who died on Sept. 25 at age 87, filled up a church. Actually, another 5,000 watched the service via closed circuit at other locations on the campus, making Palmer’s gathering even larger than the 3,000 that attended Payne Stewart’s service at the First Baptist Church of Orlando in 1999. But it was all the stories and moments and images contained in the collective remembrances of Palmer that had trouble fitting under the basilica’s ornately-arched 50-foot ceilings. Bill Brink of the Pittsburgh Post-Gazette live-blogged the service and captured many of the great lines delivered. And here is Jack Nicklaus, who apologized for reading from a script, but as you'll see he did so for practical reasons. Everyone squinted to follow its ascent, and soon it vanished into the clouds. That’s what this last week has been like with Arnold Palmer. For decades, he was always here for us, bringing sunshine into everybody’s lives. And just like that, he’s gone, heading off somewhere behind the clouds. Here is the Golf Digest special issue coverage hitting newstands today ($13.99) and digitial subscriber tablets on Tuesday. Congratulations to all, especially Mike O'Malley, Ken DeLago and Christian Iooss for the quick turnaround and excellent presentation for what is an incredible summary of the best Arnold Palmer writing and images. Artist Dale Stephanos created the cover illustration. And here is the plan for Golf Channel's Tuesday coverage of Mr. Palmer's funeral in Latrobe. ORLANDO, Fla. (Oct 3, 2016) – Golf Channel will devote an entire day to celebrating the life and legacy of the King, including live coverage of Arnold Palmer’s memorial service on Tuesday, Oct. 4 at 11 a.m. ET from the St. Vincent College basilica in Latrobe, Pa. Morning Drive and Golf Central will both be onsite throughout the morning prior to the memorial service. Coverage will feature interviews with special guests in attendance, along with live reports throughout the day. Reporting on-site in Latrobe will be Golf Channel’s Kelly Tilghman and Rich Lerner. At 1 p.m. ET following the memorial service, Golf Channel will feature a special airing of Arnie, Golf Channel Films’ four-part documentary on Palmer’s life and career. The celebration of the King continues at 5 p.m. ET, with highlights of Palmer’s 1960 Masters victory. At 6 p.m. ET, a second Golf Central Special show will recap the memorial service from earlier in the day, hosted by Tilghman and Lerner on-site in Latrobe and featuring special guests. Primetime will return to previously scheduled programming, including the season finale of Feherty, premiering at 9 p.m. ET and featuring fellow Western Pennsylvania sports icon, Pittsburgh Steelers’ Hall-of-Fame quarterback Terry Bradshaw. Golf Channel’s original series Driver vs. Driver presented by Wilson premieres at 10 p.m. ET, showcasing aspiring golf equipment designers developing the next retail driver for Wilson Golf, Palmer’s original equipment brand. Fans who are unable to attend Tuesday’s memorial service in-person are being encouraged to congregate at their local golf course to watch with fellow fans of The King and post a photo on social media with the hashtag, #ArniesArmy. **Gerry Dulac with this rundown on the service plans. Including this on speakers. Jack Nicklaus, his long-time friend and chief rival in the 1960s, will be among the speakers who will remember Palmer for the manner in which he popularized their sport and the impact he had on countless golfers in the U.S. and around the world. Also speaking at the service will be PGA Tour Commissioner Tim Finchem, former LPGA Tour Commissioner and long-time friend Charlie Meacham and former LPGA Tour star Annika Sorenstam. The service will be televised live by the Golf Channel.